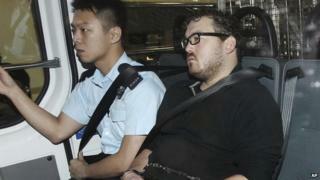 The trial of a British banker accused of murdering two women found in his Hong Kong flat has been adjourned. Prosecution lawyers asked for the extra time to obtain further documents for their case against 29-year-old former Bank of America employee Rurik Jutting. He was arrested after police found two bodies, including one in a suitcase, at his apartment in Wan Chai in November. Mr Jutting, originally from Cobham, Surrey, was not required to enter a plea at the Hong Kong court. He is charged with the murders of Sumarti Ningsih on October 27 and and Seneng Mujiasih on November 1. Police had been called to Mr Jutting's property on Halloween night and first found 29-year-old Ms Mujiasih with wounds to her throat and buttocks. She died a short time later. The body of Ms Ningsih, 23, was found in a suitcase. Cambridge-educated Jutting was ruled mentally fit to stand trial for the murders after undergoing psychiatric tests. Jutting moved to Hong Kong from London in July 2013 and is understood to have quit his highly-paid job in the days before the incident. The case will resume on 8 May.